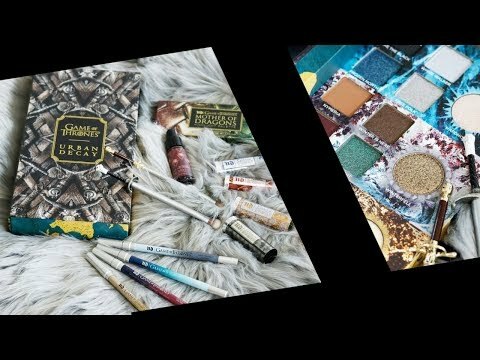 The KBShimmer Spring 2016 collection launched earlier this week and I’m excited to share it with you. 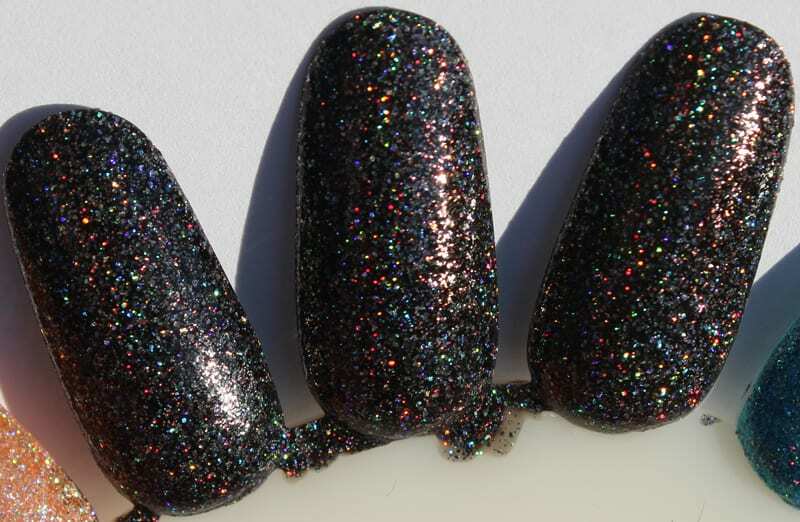 This collection has 7 new mega flame shades, which are holos with micro holographic glitters in tinted bases. They’re AMAZING! The other half of the collection has a touch of 90’s nostalgia with the neons, holos and pastels. The swatches below were taken in my lightbox under daylight bulbs and in the late afternoon sun. The photos in the lightbox are more true to color. 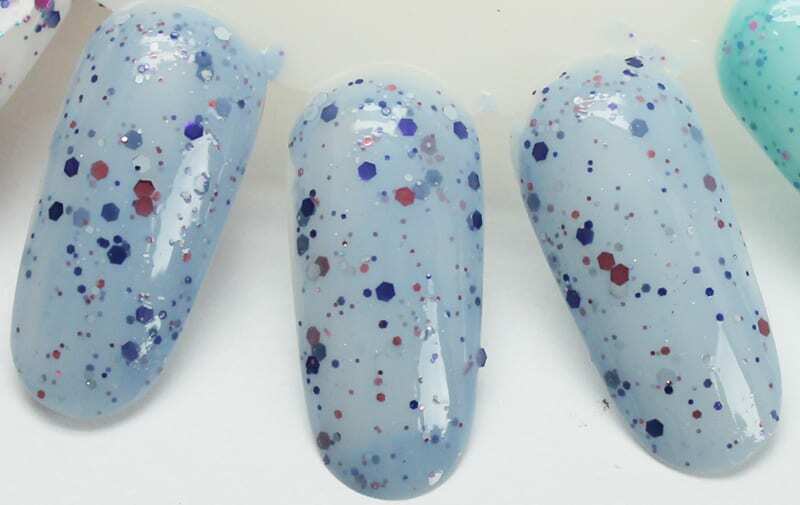 Like an abstract painting, this white crelly polish has pops of colors in fuchsia, turquoise, and sapphire. 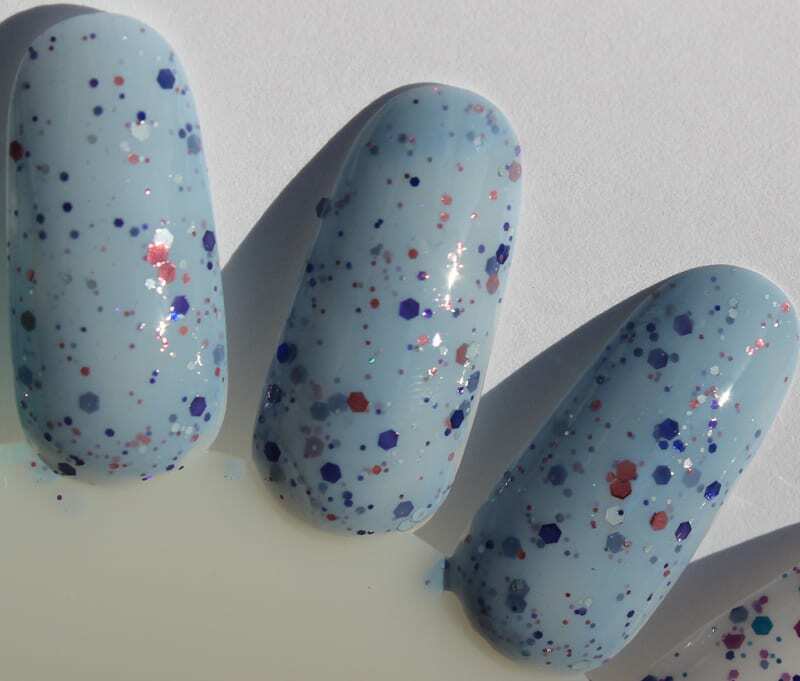 Layering in 3 coats gives this polish the depth and dimension of quality art work. 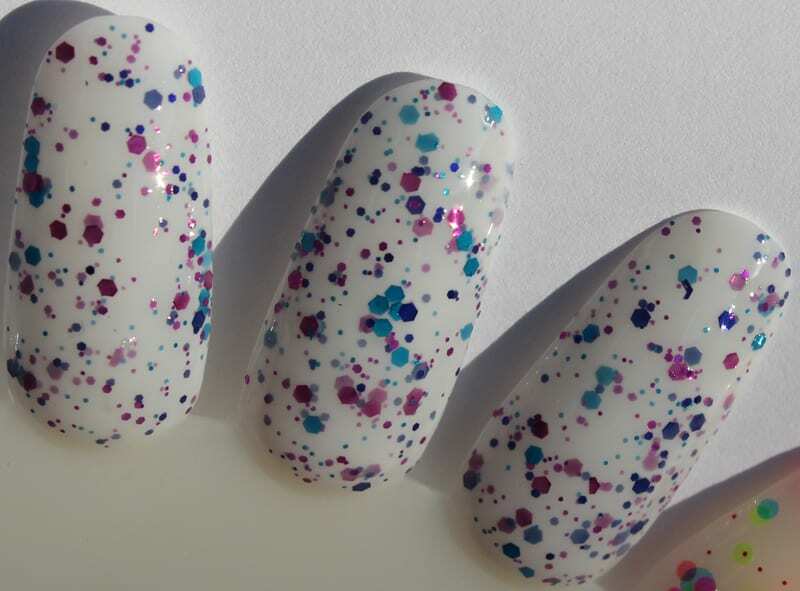 If you are a fan of crellies, you’ll love this white polish. I love the turquoise, fuchsia and blue glitters in it. New to our Ultra Flair line up, Peony Pincher is a pastel pink with lavender undertones. 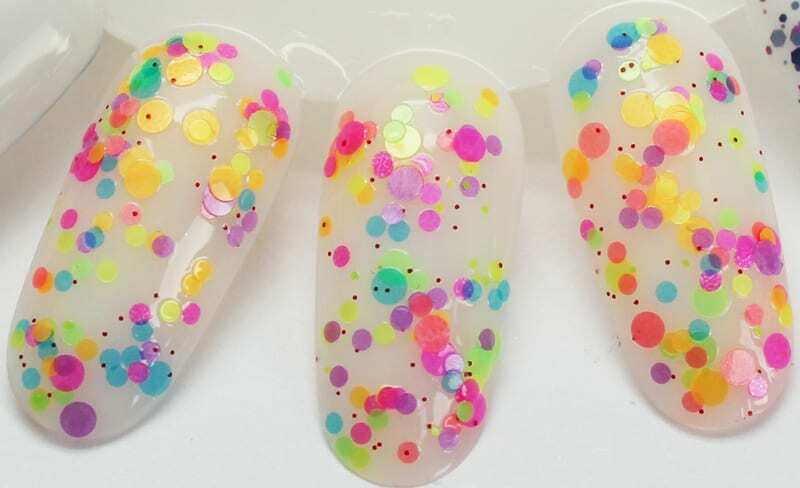 This floral linear holographic polish shines best in bright lights. The holo is strong in this pink. While it’s not flattering on my skintone, it’s a gorgeous shade. I love the holos. A dusty peach shade, this shimmery orange crelly sparkles with micro holo dust and golden micro flakes. Based on the Pantone 2016 Spring/Summer shade Peach Echo. This is a fun peachy orange. I really like the golden flakies in it. It screams summer to me. It’s not as bright as shown in the photos, it kept wanting to show up as a neon. I dabbed this one on. It’s a lot of fun. It looks great layered over black, white or purple cremes. A lightened, green leaning aqua, Pool Paradise offers pops of neon pink, periwinkle and aqua glitters. Based on the Pantone 2016 Spring/Summer shade Limpet Shell. 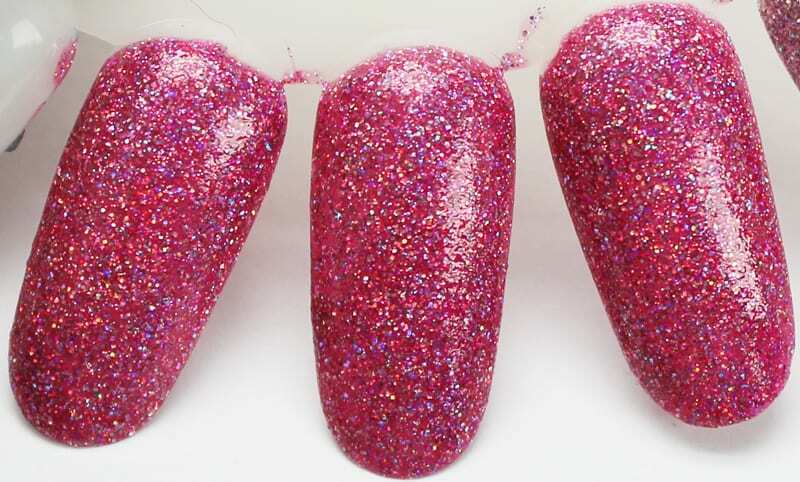 I love the aqua base in this crelly and I think the pink glitters in it really make it stand out, perfect for spring. This is an interesting crelly. To me it screams guys and plaid, with all the blue and reddish plummy glitter. 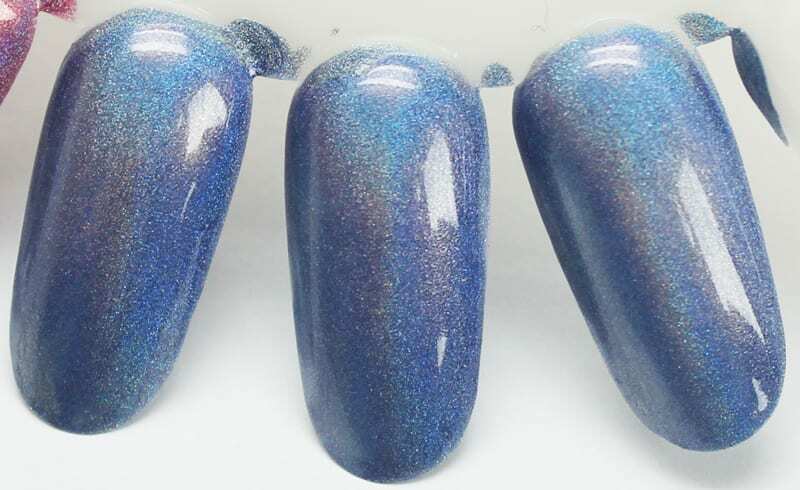 New to our Ultra Flair line up, Purr-fectly Paw-some is a pastel moody blue linear holographic polish with steel gray and lavender undertones. A relaxing twist on a traditional periwinkle shade. Based on the Pantone 2016 Spring/Summer shade Serenity. 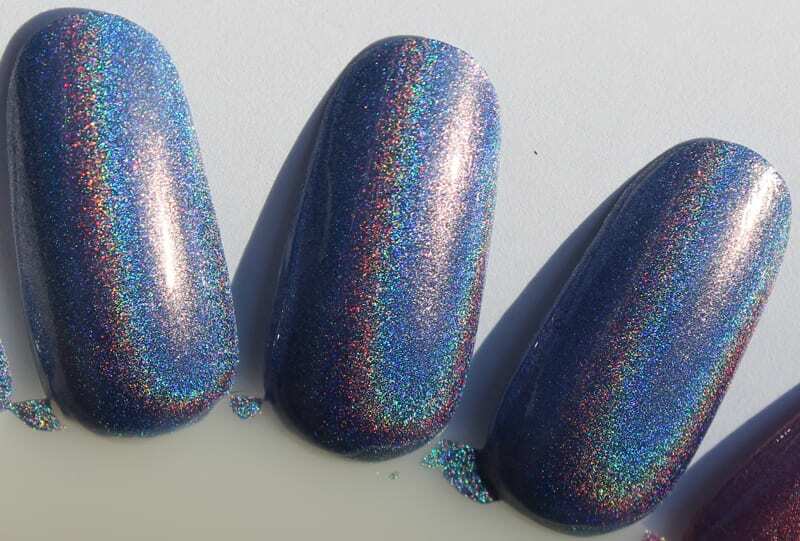 I love the lavender tone in this color and the holo is stunning. Plus, the name is so cute! 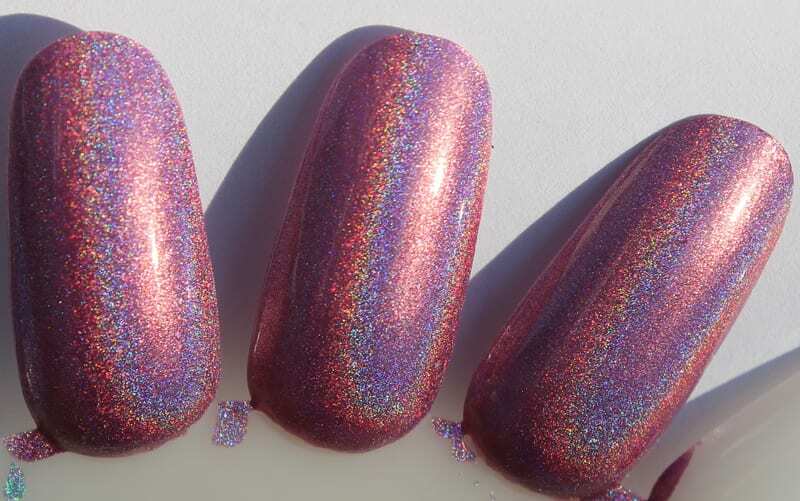 A raspberry pink, this mega holo shade is the ideal berry color with blue undertones. I got so many compliments while wearing this shade! It’s beautiful berry pink! A copper leaning peach, this muted orange shade’s strong holo flame will have you longing for spring. I swear KBShimmer puts something into their oranges because I never shy away from them. 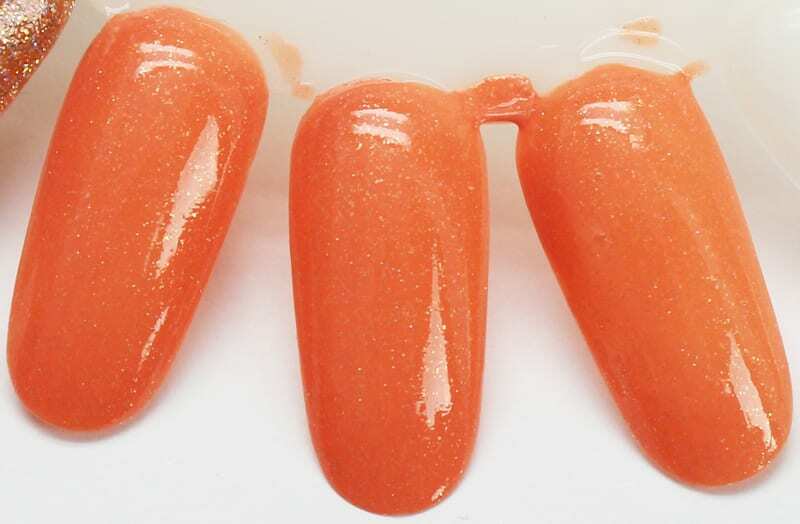 This is a beautiful orangey peachy neutral that’s fun to wear because of the mega flame holo finish! This near celery green yellow is fresh and vibrant for spring. This is a fun soft green. A twisted citrus green, this deep lime shade is a refreshing pop of color for warmer weather. 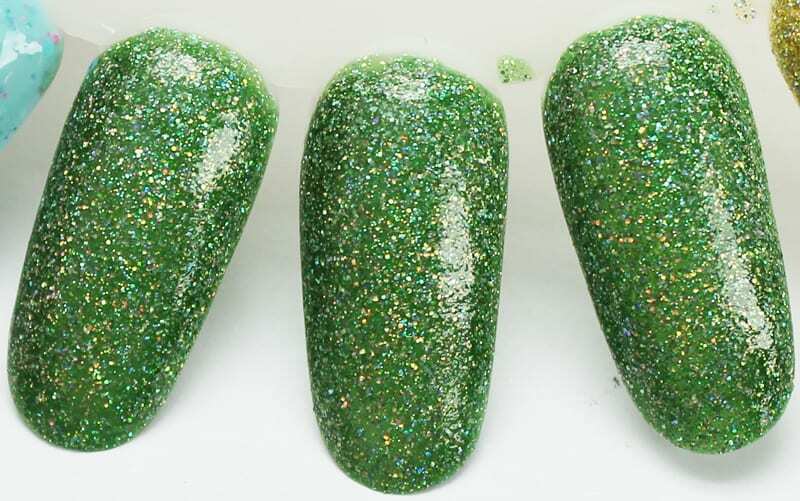 If you are into rich greens, you will love this shade. I swear, every color in the mega flame finish is gorgeous. Crystal clear waters of the Caribbean inspired this sparkling deep aqua color. 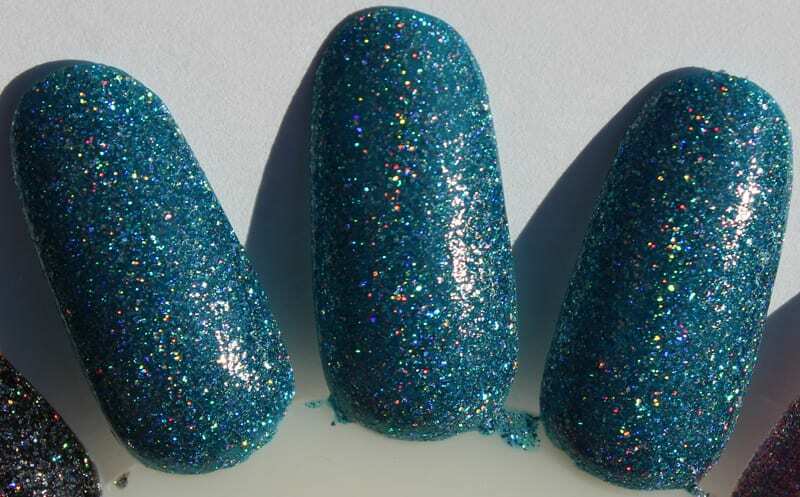 This is a perfect blue for Teal Thursday! If you are a fan of blues, you need this one. 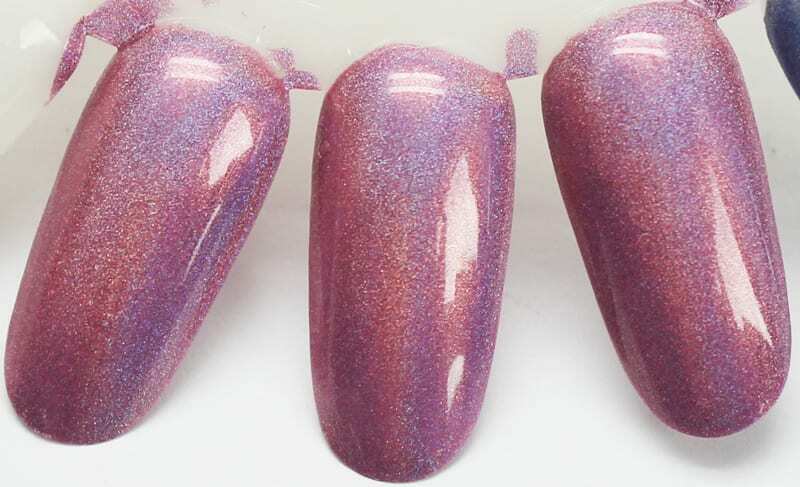 A lilac purple, this pastel polish packs a punch of holo shine. This is a very soft, delicate, feminine lilac shade. Like a clear country night, Night Bright sparkles like a billion stars in the sky. Only this night sky is best viewed in the light. 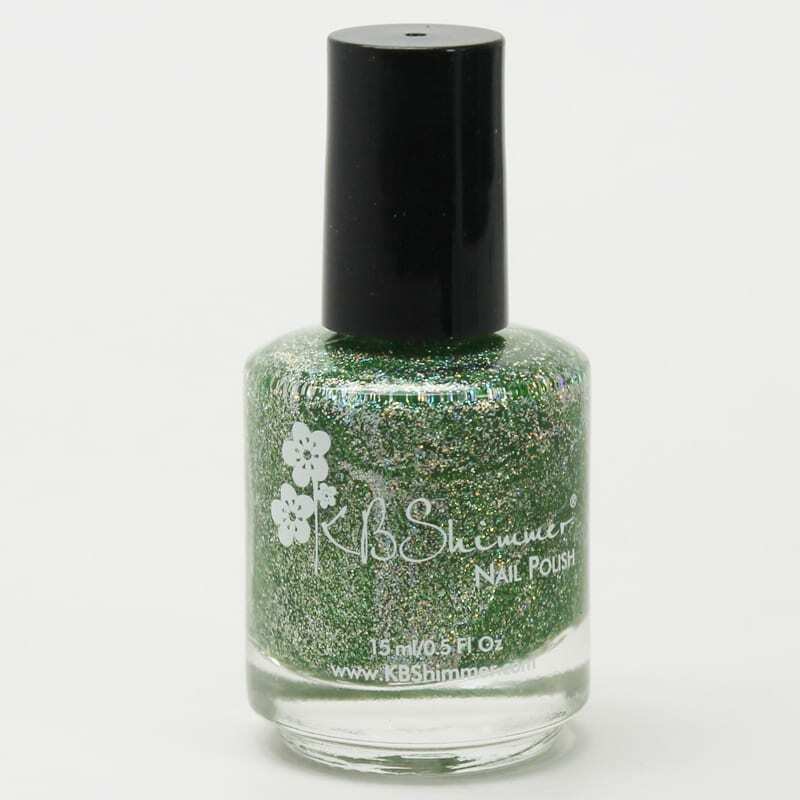 If you only try one polish from this collection, try this one. It’s a stunning black. I could wear this for weeks on end and not be bored because of the beautiful rainbow of glitters in it. 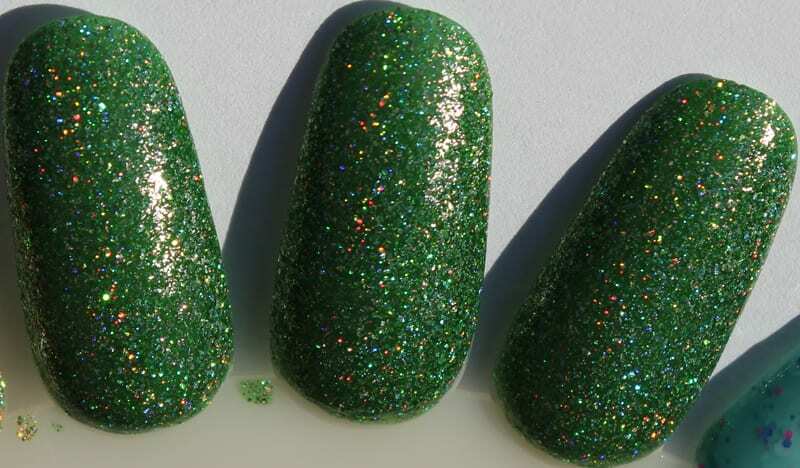 I always get a laugh out of the names in the KBShimmer collections. The puns are amusing. 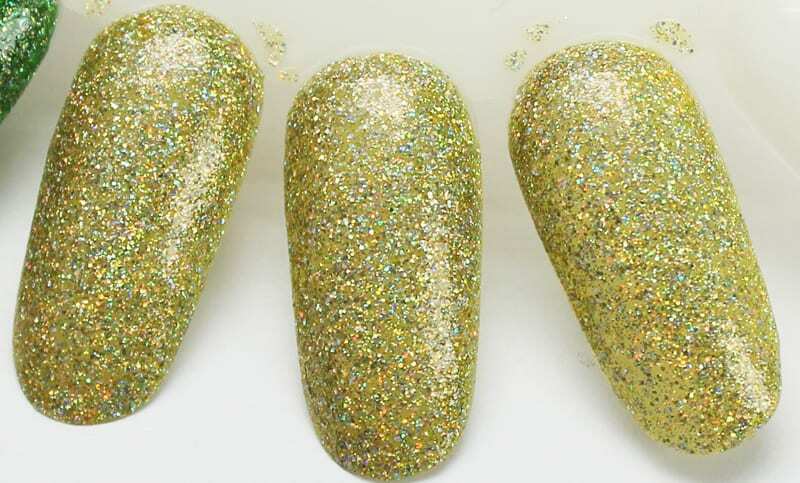 The formula for these polishes were easy to work with, which is typical with KBShimmer. Of course, my favorites are all of the Mega Flames. Because HOLO AND GLITTER! OMG, so gorgeous, seriously! For me, I applied 2 coats of color and then 2 coats of top coat for a smooth finish on my nails. I love super shiny top coats. I sincerely hope that there will be more colors released in the Mega Flames formula. If you’re looking for more subtle shades, try Peony Pincher, Purr-fectly Paw-some, So Flamous, or Things That Make You Go Bloom. If you want bolder shades that won’t quit, Hello Dahlia, Upside Round, Ripe for the Pink-ing and Smells Like Green Spirit are great choices. Of course, you can’t go wrong with a classic black with a twist like Night Bright. My top picks are Night Bright, Upside Round, Set in Ocean and Pools Paradise. 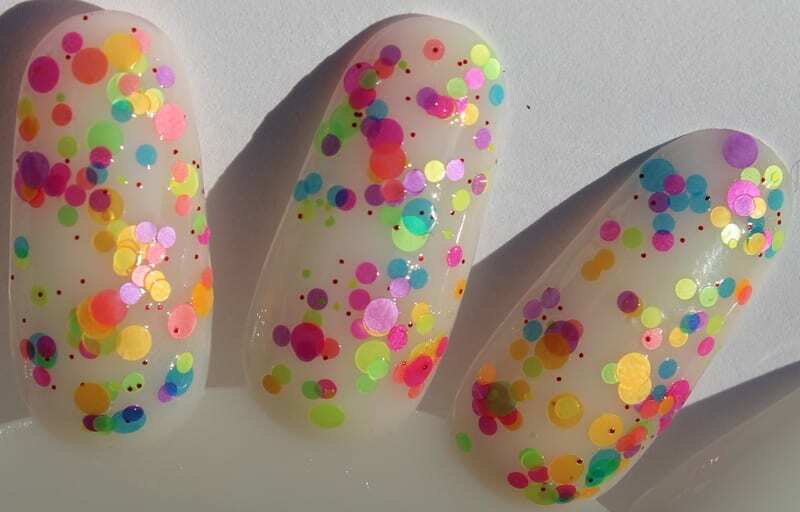 What do you think of the KBShimmer Spring 2016 Collection? Which colors are your favorites? Things That Make You Go Bloom… So perfect! Well, they all are.. but that has to be in my top 3! As usual, KB makes another beautiful line! Those are all so gorgeous, it’s hard to pick a favorite, though Upside Round really stands out. 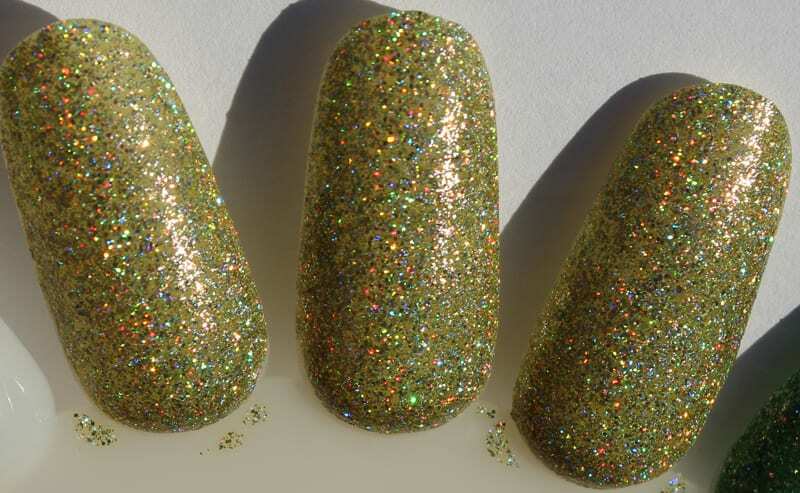 I love those holo glitters too! Upside Round is definitely my favorite! ? but they are all so preeeeeety! Ooooh. Purr-fectly Paw-some, Upside Round, Ripe For the Pink-ing, Smells Like Green Spirit, Set In Ocean, and of course, my favorite, Night Bright, might have to be mine! These are all really pretty. I think I’m most attracted to Hello Dahlia, though. I’m so drawn to orange polishes when it starts getting warm. These are so beautiful. I love Upside Round. It looks so fun! I think ‘Things That Make You Go Bloom’ is my fave!